Sea cruises are being rated ever higher on the tourism scale in Schleswig-Holstein. This year, more than 2 .1 million sea travellers are expected in Kiel and 600.000 of them – or 17% more than last year - will be cruise ship passengers. More than 1.5 mln ferry ship passengers are also expected, learned BC from port of Kiel press release. Dr Dirk Claus, Managing Director of the Port of Kiel said: “Our attendance at the ITB Travel Trade fair in Berlin underscores the growing importance which the federal German state of Schleswig-Holstein and its state capital Kiel attach to sea tourism. Cruise shipping is the growth market in northern Europe.” Every year passengers generate a turnover in excess of 50 mln EUR in Kiel alone. Already well-known as a starting point for cruises to the big cities on the Baltic and along the Norwegian fiords, the port has also made a name for itself as a destination in its own right. International passengers who arrive in Kiel as part of an ongoing cruise or head for the port on ferries from Scandinavia, undertake daily land excursions throughout Schleswig-Holstein as well as to Lübeck and Hamburg. During this year’s cruise shipping season, 166 visits by 32 different ships have been registered. “The number of visits as well as the number of passengers will increase significantly”, said Dirk Claus. “Overall cruise ship tonnage will pass the 11 mln GT mark for the first time”, he added. The season starts on April 6th with the arrival of Fred Olsen Cruise Lines’ “Boudicca”. The most frequent visitors will be the ships of AIDA/Costa, TUI Cruises and MSC - with as many as five ships from AIDA berthing in the port of Kiel. The biggest ship this season will be the “MSC Preziosa” of 139,000 GT which will make her first ever visit to the Kiel Fiord on April 28th. Seasonal highlights will include the presentation of the latest cruise ship of TUI Cruises – the new “Mein Schiff 1” - on April 27th as well as seven further maiden visits by cruise ships, including that of Cunard’s “Queen Victoria”, which will berth at the Ostseekai Terminal on July 17th. Fourteen ships, among them two river cruise ships, are expected to call during the Kieler Woche sailing regatta, which is being held from June 16th to June 24th. Newcomers to Kiel this year are the U.S. shipping company Viking Ocean Cruises and the Spanish shipping company Pullmantur Cruises. The Port of Kiel operates Kiel’s commercial port on behalf of the Schleswig-Holstein state capital of Kiel. 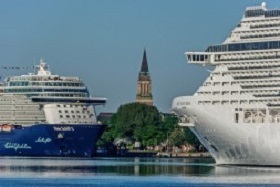 Three terminals are available in Kiel for ferry and cruise ships - at the Ostseekai, Norwegenkai and Schwedenkai - and all are in close proximity to the city centre. In addition ships are able to tie up at the cruise shipping Berth No. 1 in the Ostuferhafen. Kiel is also linked daily by ferry shipping services to and from the Norwegian capital Oslo (Color Line), Gothenburg (Stena Line), and Klaipeda (DFDS). ”Kiel is the market leader in ferry traffic into the Baltic, to western Sweden and to Norway”, says Dirk Claus, “and is among the most popular passenger ports in northern Europe.” Kiel is constantly investing in the expansion of its port facilities and in late summer this year will begin construction of a second terminal building at the Ostseekai. A 3,700 m² two-storey building is planned which will be of contemporary design and complement the existing terminal building in both form and function. It will open at the beginning of the 2019 cruise shipping season.